The fighting intensifies today, in order to complete the takeover of the entire camp. There still remain focal points where terrorists have barricaded themselves and refuse to surrender. According to estimations, these are "heavy" wanted terrorists, or potential suicide bombers, who are planning to die anyway and aren't eager to save their skins. This makes the fighting hard and complicated. Tough battles are being fought. Today we lost two soldiers, Matanya Robinson and Shmuel Weiss. But our boys are determined to defeat the terrorists, to fight them until they either surrender or die. By the way, all kinds of things are being bandied around regarding the ethics and humanity of the IDF. I can say with certainty that there is no army as humane as the IDF. When the women and children were leaving the camp, our soldiers approached them and handed out armfuls of bottled water. At one point someone suggested that the children might be hungry, and the soldiers began to bring out bread. Then one of the Arab women said, "The children don't want bread, they want chocolate." Of what other army on earth would she have dared asked for chocolate, after an entire week in which our blood was shed and soldiers here have lost their best friends?! Our soldiers searched every house in the camp and, by necessity, saw everything that was stashed there: money, jewelry, electrical appliances. No one touched any Arab property. Every soldier knows he has but one singular mission: to defend our homes by fighting terror. Each one came with clean hands and leaves with clean hands. In the midst of the fire and combat you get to see the warmth and love of the people of Israel. The father of one of the soldiers arrives through some back roads, carrying trays of pizza and cake. Good aunts from the Gilboa area bring us food and cake. This certainly warms the heart. Today was a black, sad, painful day. Our company was scheduled to embark on a certain mission this morning. At 4:45 AM we had already boarded the vehicles, ready to go in. But the command to get moving never came. And then we received the awful news: reserve soldiers from our sister regiment entered the camp and walked into an ambush. A number of explosive charges were ignited simultaneously and a suicide bomber ran up to the soldiers and blew himself up. They were trapped in a closed courtyard with no way out. After the explosion, murderous fire was turned on them from every conceivable angle. Eight soldiers were killed in this ambush and the rest of the men were injured. Additional forces hurried to rescue them, and then some of the rescue team were hurt. The huge explosions toppled a few houses, and three of the dead disappeared in the rubble. Initially there were rumors that these men had been kidnapped, but by the end of the day their bodies had all been located. In this encounter we lost thirteen soldiers while nine were injured, one of them critically. In another encounter one more soldier was killed and eight injured. What hurts most is the fact that these dear souls were sacrificed because of our hyper-sensitivity and caution. Many soldiers have asked why we're risking our men when we know there are no women and children left in the camp, and the only ones there are the serious wanted criminals, members of the extreme-most groups, and potential suicide bombers. Instead of demolishing those few square yards with everyone hiding in there, we're conducting house-to-house combat, while the terrorists are escaping easily through underground tunnels. Today, finally, the D-9 Bulldozers entered the camp and began to clear the area. The atmosphere today is tense and nervous. The mood is gloomy. In the afternoon the body truck comes by and it’s horrifying to see. We comfort each other, saying we're stopping potential explosions in Afula and Hadera with our own bodies. This is a simple fact. It is truly terrifying to discover the terror potential that was concentrated in this awful place. Hard to believe just how much weaponry and explosives were accumulated here. The chief of staff arrives in a chopper. There are many special forces here. The guys from the elite units come and ask to put on tefillin. Under these conditions everyone wants to be strengthened by acts of faith. Let it be clear: No one here is planning to give in. This morning I saw one of our officers, his eyes burning with determination. The guys are resolved to clean this place up completely — no matter what. They're ready to give their lives for it, even though we all have wonderful, loving parents, wives and children at home and lots to lose. The work here is very difficult, because the terrain is extremely crammed, riddled with booby traps, and there's deep concern about harm to our forces. But we will beat them, with G‑d's help. When we’re in this mode, there's really no room for anything else, nevertheless I'll note that today the army brought in mobile showers. We go in two at a time, after ten days without bathing. We refresh ourselves and go back into battle. 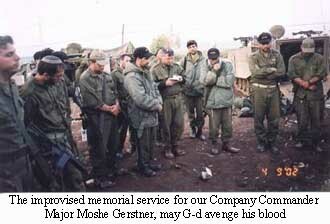 In the early evening we pray Mincha [the afternoon services] and a few soldiers ask that, since it was the seventh day after the death of Company Commander Moshe Gerstner, we should conduct a memorial gathering. I had no time to prepare for this, so I improvise. I open the Tractate Avot (Ethics of our Fathers) and read a few segments, in a catch-as-catch-can fashion. The first passage was "Do not attempt to comfort a mourner while the dead is still lying before him." It was bloodcurdlingly appropriate. Another passage I pick haphazardly is, "At twenty years of age a person is ready to pursue a livelihood; at thirty a person attains the peak of strength." Moshe was twenty-nine. In the middle of the Kaddish I am choked up with tears. I finish Kaddish weeping. Looking around I see half the company is crying. I can't continue and someone else has to take over for the El Maleh Rachamim prayer, which beseeches G‑d to find rest for the departed. All of us are moved to the depths of our souls. One of the soldiers who was with the company commander when he was hurt tells me that as soon as Moshe collapsed, all the soldiers took out the Books of Psalms I had passed around before we left for Jenin, and began to say Psalms together. One of the soldiers took pictures at our service and we send the pictures to the mourning family. It pains us that we were unable to visit them during the week of the Shiva, but what can we do — we’re in the middle of a war. At least we were able to conduct the memorial service. The Jenin refugee camp is finally defeated today. Our own fighting is much more aggressive, and the terrorists have no choice but to surrender. It’s mind-boggling to see the enormous number of barricaded fighters who come out with their hands raised in the air. During the day the campaign continues. We engage in blocking action, to prevent the escape of the terrorists on the wanted list. A canine team and a bomb removal team arrives as well. The bulldozers work hard, destroying booby-trapped houses. Yishai, my direct superior, identifies a tunnel at the opening of one of the houses. He receives an order not to enter, for fear it’s booby-trapped. More guys come over to put on tefillin. Young soldiers who just don't strike you as the spiritual type, tell me about resolutions they made if only they came out alive and well out of the Jenin crucible. Again and again you witness the Jewish spark in the heart of every Jewish person. Last night was a relatively quiet night. The shooting inside the camp continued and the noise of troop carriers and heavy machinery reverberated in our ears, but, in effect, the camp is under our control. There's still a great deal of work left, particularly in removing explosive charges set up by the terrorists. The traps are our biggest worry. At the moment the war is about avoiding charges, booby-trapped houses and booby-trapped terrorist corpses. At 8:00 AM we receive orders to bring part of the company up to one of the cleared houses, to replace the company that manned it until now. We were not told how long we'd be staying in the house, and there was no time set for the overall mission, but we assume it’ll be a few days, at least two. We load the troop carrier with combat rations and water cans and drive into the camp. The house is situated strategically at the center of the refugee camp, right where the resistance was the fiercest. We connect with the company we were replacing. We get updated on the situation in the area and I look around. This is my first opportunity to look at the refugee camp without fear of a sniper's shot. What I see shakes me up as a man, as a warrior and as a Jew. On every house there are giant pictures of shahids. Even the UN Relief Agency building is adorned with enormous shahid posters. 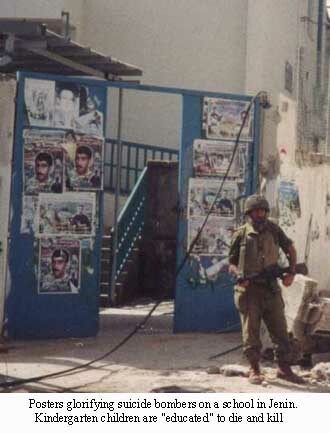 (Incidentally, our troops were shot from that building as well...) When I see the pictures and the writing on the walls, I suddenly grasp the magnitude of the horror of the total brainwashing that took place in the Jenin refugee camp, yielding an assembly-line production of shahids. (It is disturbing to use the term shahid, which translates as "holy man," to describe the lowliest murderers who blow themselves up among civilians, women and children, whose only crime is that they're Jewish). You see the hatred on the walls. This in itself makes your hair stand on end. I wish everyone who still doubts the need for Operation Defensive Shield would come and see this revolting display. I think about the education I give my daughters — imbuing them with the importance of helping others, loving their fellow, loving the Torah, studying it, the sanctity of every human being created in the image of G‑d. I compare this to the education that encourages jihad, hatred, suicide. Suddenly I understand the background for the suicides of boys and girls of sixteen, still unable to form their own opinions, brainwashed by a satanic education system hell-bent on producing a chain of "shahids." Our soldiers enter places from where they were shot at. When you stand in these posts you realize the terrorists weren't such great heroes. They simply positioned themselves at excellent shooting angles, high up, from which they could hit us below. Our positions were so inferior, we couldn't get back at them. With hindsight we recognize that our company commander actually saved all our lives by running ahead and getting hit first, following which we all figured out how dangerous things were and took cover. If the terrorists had waited a little longer and permitted the whole force to get further inside, they would have been able to pick off everybody, like in a shooting gallery. At 11:00 AM I receive an order to collect the guys from our company who are at the roadblock and to fall into one column with all the troop carriers, for an organized regimental retreat. We still don't know whether we’re done with our tour of duty, but we’re happy to be getting out of this awful place. At 12:00 noon our convoy begins moving toward the roadblock, where we’re told we need to get to base by nightfall in order to return our equipment. On the way, while driving the troop carrier, I think about our situation. 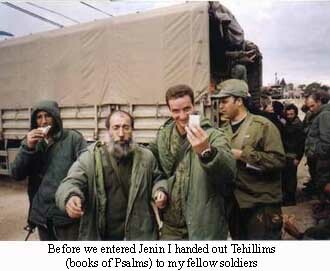 True, we’re happy to leave, but the company has left its most precious possession in Jenin, our commander. One of the guys says later, "We have an open account with Jenin." This wound will remain unhealed. After leaving Jenin we assemble for a discussion with the Brigade Commander. Some of the discussion is of the kind done only inside the family. At the end of his talk the commander says that our reserve brigade, No. 5, fought in one of the toughest battles in IDF history, with professionalism, a superior fighting ability and self sacrifice, all in order to avoid hitting innocent civilians, despite the fact that many of them collaborated with the terrorists. The commander says that no regular army brigade would have done a better job. From my point of view, as a soldier of the Fifth Brigade’s Second Platoon, I have to agree with every word. Among our soldiers there's resentment about media reports claiming that the reservists are lesser fighters than regular army soldiers, and that’s why so many of us were killed. The brigade commander says he informed his superiors he did not want anyone else to take our place: we began the Jenin operation and we would leave only after the camp is conquered and defeated. Which indeed has happened. Incidentally, the commander tells us that one of the elite unites' commanders told him, "After seeing your boys, I would want them by my side even when there's a hijack and we're called on to free the hostages." It's 11:00 PM. We're on our way back to base. I'm riding with three of the company veterans who've all been called up in an Order-8: Ahara'le Rot, Itzik Medili and Moshe Mizrachi. On the way we stop at a restaurant. In general, at the end of a reserve tour, there's an unofficial custom in our company to find an “ultra”-kosher restaurant (so I can participate) where we swap stories and insights about the training session, the exercise, or the action we’ve just completed. This time it's different. The guys are eating simply because they're hungry. We're in no mood for stories. Our gazes are contemplative, even sad. 1:00 AM. We're busy returning equipment. There's quite a mess. The entire regiment is here, and most likely we won't finish the assignment in one day and need a few workdays to bring the equipment back up to speed. At 4:30 AM we complete the first part of the task. We’re told a general wants to talk to us at 7:00. We didn't really feel like staying and spending yet another night in our sleeping bags, only to be awakened in two hours to be told how well we performed. We decide to go home. It's Friday, so I want to get home in the morning hours, make it to shul on time, immerse in the mikvah, pray, and then catch up on my sleep in preparation for Shabbat. I call on the way home, announce my arrival and ask my wife to prepare coffee in disposable cups for the guys, so they could drink while riding on — mine was the first drop-off point. On the way, Itzik asks Ahara'le to take the wheel from him (something that happens only when he’s exhausted and worried he’ll fall asleep at the wheel). The last thing we need now, after getting out of Jenin in one piece, is to get ourselves into a car crash. 7:00 AM. I arrive at my shul. Meet the regulars, who are delighted to see me. Some of the guys here are still out on an Order-8, but I’m happy to see whoever’s here. Since today is Rosh Chodesh, the first of the new month, and the Torah is read, I have the opportunity to be called up to the Torah and make the special HaGomel blessing — to express my gratitude to G‑d for carrying me through a life-threatening situation. 1:00 PM. I bring my undeveloped film in. I had taken shots of the gang before going up to Jenin and then inside the town itself. 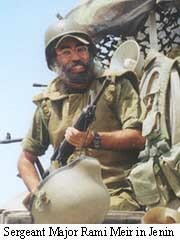 I also took a picture of company commander Moshe a few minutes before the onset of the last day of Passover. I pray that it comes out well, so I can give it to his family members. Indeed, the picture was of reasonable quality. I order a few enlargements, the last tangible memory of Moshe. A few minutes before Shabbat I receive an emotional phone call from Moshe's mother. She tells me that she read part of my diary on the Internet. She thanks me and we make up to meet on Memorial Day (for the fallen IDF soldiers) at the cemetery, after which the whole company will go to Moshe's home, to meet his wife, Michal, his father, brothers, the entire family. At 8:00 in the morning a Channel One TV crew comes to Kfar Chabad, to shoot a meeting on my lawn with some of the men from the company. There’s Major Yehuda Mashav, the company second-in-command who replaced Moshe during the fighting in Jenin, and two other warriors, Sergeant Majors Nissim Schnitzer and Nir Comissar. We try to convey some of our feelings about Moshe and the fighting in Jenin and the extraordinary humaneness of our soldiers. I think we succeed. In the evening they broadcast a long piece that captures the spirit of what we said. At 11:00 AM we come to the cemetery, which was packed with soldiers and civilians. I meet many soldiers and officers who are not from our own company, all of them friends of Moshe from previous stations in his life. We arrive at the memorial service in civilian clothes, I in a suit and a hat. From the corner of my eye I glimpse one of the guests who stares at me in astonishment, obviously wondering what is this charedi ("ultra-orthodox" guy) doing, pushing himself into the group of warriors. To my relief, one of our officers, Operations Chief Tzvika Kasman, (former commander of Company B) breaks the silence and tells the man who I am and what I'm doing here. The meeting in Moshe's home is very emotional. The guys talk about Moshe for hours. I won't go into detail here about the conversation. We all resolve to maintain our ties with his family. 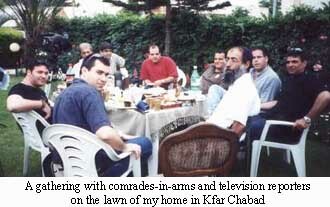 We plan to hold a thanks-giving meal, dedicated to Moshe's memory, with his family, in my home in Kfar Chabad. This diary is dedicated to the memory of my beloved commander, Major Moshe Gerstner, may G‑d avenge his blood, who fell in Jenin on the seventh day of Passover, 5762. I was in Yerushalayim when you were in Jenin I was in Yerushalayim when Operation Defensive Shield was happening. It was a frightening time, before that there were all those suicide bombs going off and then during, there was so much military activity around Yerushalayim. I remember once around this time, I saw a BBC report showing frightened Palestinian children running from an IDF tank. I couldn't believe that the whole world was demonizing us so. But I really have no idea what went on in those Arab towns in Shomron and Yehudah. I wish I could have been able to see what the author has seen, the UN relief agency's building plastered with pictures of the shahid. I wish I could understand what I experienced in Eretz Yisrael those years I was there, in which there was so much painful fighting.